This curry is easy and quick to make, especially if you cook it in an Instant Pot. I took some liberties with the spices, as berebere is an Ethiopian spice. If you don’t have any, add a touch of cumin, clove, and cayenne. You can use any kind of vegetables–those in the recipe are what I used, but experiment with your favorites. I also like to saute some portobello mushrooms with the onion. Summer squash would be a great addition too. For variety, substitute sweet potatoes for some or all of the white potatoes. You can use homemade coconut milk instead of canned if you make it nice and thick. Don’t use coconut drink as the curry won’t have the same richness. I topped this version with a few cubes of baked tofu. 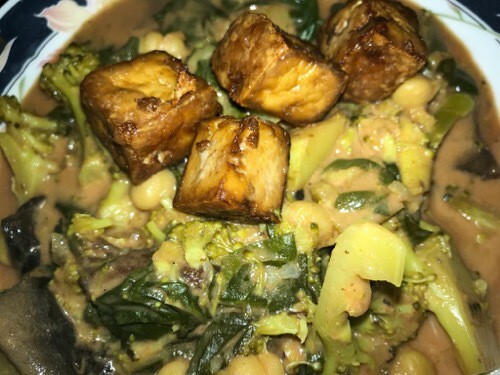 Tempeh or seitan (if not gluten free) would also add nice texture and flavor. Add the garlic and ginger to the onions and cook until they become fragrant—about a minute. Add the tomato sauce, vegetables (except spinach), garbanzos, and seasonings and stir to combine. Add enough water or stock to not quite cover the mixture. Simmer until the vegetables are tender, about 20 minutes. If using an Instant Pot, use the manual setting and cook for 5 minutes, then release the pressure. Turn down the heat and stir in the spinach (if using) and coconut milk. Continue to cook, stirring, until the whole mixture is hot and the spinach is wilted. Do not bring to a boil. Serve the curry on its own or over rice, garnished with chopped cilantro.